Kud Ting wetland in Nong Khai province, Thailand is a natural habitat of R. rubrodorsalis. 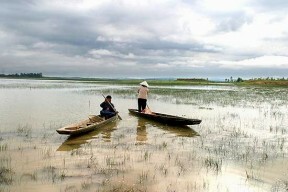 It is found most abundantly in the lower Mekong river basin, northeastern Thailand. One interesting collection locality is an area of wetland called Kud Ting in the northern province of Nong Khai where it lives sympatrically with R. spilocerca and Boraras micros. In 2008 the Thai government proposed that Kud Ting be designated a protected Ramsar site due to the diversity of species found there. Supposedly it also occurs in central parts of the country including the Chao Phraya drainage with its associated floodplain and even Bangkok although specific locality details are scarce. Some sources state that its range extends into Laos and Cambodia as well as the Mae Klong basin in western Thailand although to date we have been unable to locate any definitive records. This species has mainly been collected from shallow margins of gently flowing or still waters including swamps, marshes, reservoirs and floodplains. Apparently it shows a preference for clear waters containing dense growths of fine-leaved aquatic plants and is known to move into temporarily inundated areas during the wet season. A large female can measure 1.2″/3cm. A tank measuring 18″ x 12″ x 12″/60cm x 30cm x 30cm/42.5 litres is big enough to house a small group of these. Choice of decor is not especially critical although the fish tend to show better colouration when maintained in a well-planted set-up with a dark substrate. The addition of some floating plants and driftwood roots or branches to diffuse the light entering the tank also seems to be appreciated and adds a more natural feel. Filtration does not need to be particularly strong as it mostly hails from sluggish waters and may struggle if there is a fast current in the tank. Like similar species such as R. borapetensis it is probably a micropredator feeding on small insects, worms, crustaceans and other zooplankton in nature. In the aquarium it will accept dried foods of a suitable size but should not be fed these exclusively. Daily meals of small live and frozen fare such as Daphnia, Artemia and suchlike will result in the best colouration and encourage the fish to come into breeding condition. This species is very peaceful indeed making it an ideal resident of the well-furnished community tank. As it places no special demands in terms of water chemistry it can be combined with many of the most popular fish in the hobby although proper research is essential and its small adult size must be a consideration. 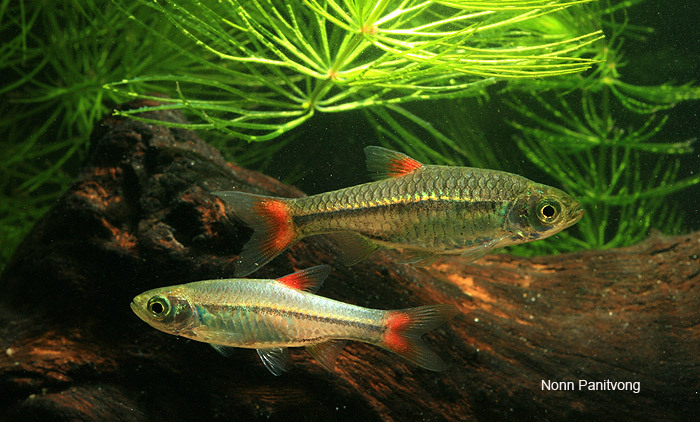 A community based around one of its native countries or river basins would make an interesting project with possibilities from Thailand alone including various Badis, Betta, Danio, Trigonostigma, Puntius, Pangio, Lepidocephalichthys, Boraras and other Rasbora species amongst others. 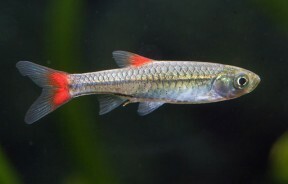 Males are noticeably smaller and slimmer than females and tend to be more intensely coloured, especially when in spawning condition. Like many small cyprinids this species is an egg-scattering, continuous spawner that exhibits no parental care. That is to say when the fish are in good condition they will spawn often and in a densely-planted, mature aquarium it is possible that small numbers of fry may start to appear without human intervention. However if you want to increase the yield of fry a slightly more controlled approach is required. The adult group can still be conditioned together but one or more small, say 12″ x 8″ x 8″/30cm x 20cm x 20cm/71 litre containers should also be set up. These are best kept dimly lit and the base covered with some kind of mesh of a large enough grade so that eggs can fall through it but small enough so that the adults cannot reach them. The widely available plastic ‘grass’-type plants can also be used and work very well. The water itself should be of slightly acidic to neutral pH with a temperature towards the upper end of the range suggested above. As a guideline forum member Mick Wright has had great success with this species and spawned it with pH 6.0, gH 3-4 at 78°F. When the adult fish are well-conditioned and the females appear full of eggs the fish that are to be spawned should be selected. Mick recommends choosing a reverse trio of two males and a single female and says that spawning occurs in the early morning. The species is quite fecund and as many as 250 eggs may be produced by a single female. Incubation in rasboras is temperature-dependant to an extent but should take around 24 hours with the young free-swimming 3 days later. Initial food should be Paramecium or similar introducing Artemia nauplii and/or microworm once the fry are large enough to accept them. R. rubrodorsalis occurs sympatrically with the very similar-looking R. borapetensis over some of its natural range but is much the rarer of the two in the aquarium hobby. 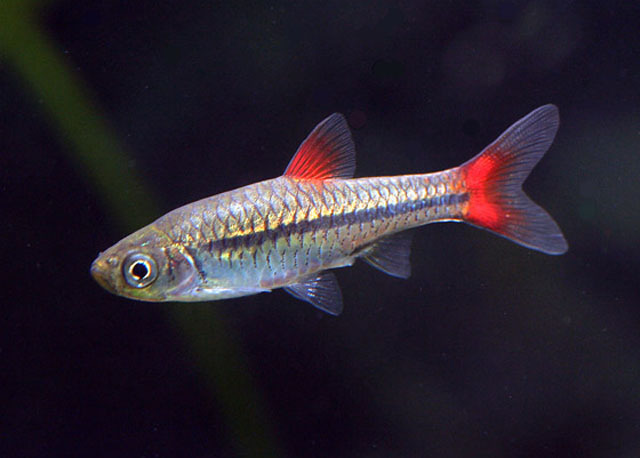 They are easily distinguishable from one another because R. rubrodorsalis has a bright red blotch in the dorsal fin whilst in R. borapetensis the dorsal is colourless and only the base of the caudal fin is coloured red. This species is sometimes sold under the erroneous name(s) R. beauforti or R. sp. cf. beauforti, probably because it was pictured as such in Rainboth’s 1996 handbook ‘Fishes of the Cambodian Mekong’ before being officially described in 1997. R. beauforti was in fact described from the Kumai River, Central Kalimantan (Kalimantan Tengah), Borneo by Hardenberg (1937) and represents something of an enigma as neither Brittan (1954) nor Roberts (1989) were able to locate the type specimens during their studies of the genus. Nobody has been able to confirm what the ‘species‘ actually looks like and Roberts surmised that it may turn out to be a nomen dubium. Rainboth, W.J. 1996 - FAO, Rome, 265 p.
Roberts, T.R. 1989 - Mem. Calif. Acad. Sci. 14: 210 p.